Hartford, CT - State Senator Tony Hwang (R-28) released the following statement today in regard to the opening of the 2019 Legislative Session. You can find Senator Hwang online at his website www.SenatorHwang.com and on social media @SenatorHwang on Facebook, Instagram and Twitter. 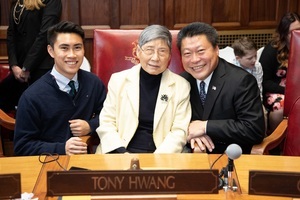 PHOTO: State Senator Tony Hwang enjoys Opening Day at the Capitol with his Mother and Son.